I adore these chicken or rooster costumes. Babies look so precious in them. Whether you baby is lying down, sitting up or strutting around, he or she will look great in one of these. Personally, I think this is one of the best baby animal costumes for a baby or toddler that has started to walk because they look so cute waddling in it. This baby chicken suit is a good quality costume. It’s fluffy and well-constructed. The costume is a zipped jumpsuit. It’s machine washable for convenience. Fabric is 100% polyester. At the time of writing, this baby chicken costume has an average rating of 4.6 stars out of 5.0 for reviews on Amazon. The yellow feet come with the costume but they are detachable so if your baby is walking you have the choice of whether you use the included feet or his or her own shoes. This costume is very warm and great for a cooler climate. If your little one is going to be wearing it in a warm climate it may get too hot. This baby chicken costume is a zip up onesie. It comes in four different sizes. Feet are not included, but you can easily buy yellow socks for your baby instead. The fabric is a very soft flannel fabric. The onesie zips from the top and the bottom for convenience. If you don’t like the idea of a full costume for your baby, this baby chicken onesie is a great alternative. You could also use this chicken onesie costume at home as a warm pajama alternative. Any selection of baby animal costumes should always include ducklings! This baby duck costume is well made and durable. The 100% polyester material is a fuzzy finish with snap closures for easy diaper changes. The duck head/hood is part of the duck suit and there’s a velcro strap under the chin to secure it. This costume is machine washable. It comes with snap seal bag which you can re-use for storing it. Although I don’t know why anyone would want to put it away because it is so adorable. Wear this costume for fun at any time. This baby duck costume does not come with feet. However, it is very easy to buy some yellow socks for you baby just like the picture above. If you prefer a onesie rather than full duck costume which is more bulky, take a look at this baby duck onesie costume. Onesies are cute baby animal costumes alternatives. You can use them as a costume and wear them at home as well. Your baby will look adorable as a little duckling. This is the cutest baby lobster costume you’ll find! Look at those adorable claws. If you’re looking for baby animal costumes you really can’t beat the lobster! The costume is 100% polyester and machine washable.It includes the lobster feet which are detachable slip-on booties with skid-resistant bottoms. The lobster costume zips up and the hood has a velcro attachment to help secure it in place. The lobster suit has snap closures for easy diaper changes. The fabric is good quality and the stitching is well-made. This is a very popular baby lobster costume with an average of 4.6 stars out of 5.0 for more than 500 reviews (at the time of writing). Because it is a high quality baby costume you can use it for subsequent siblings. This is another cute baby lobster costume. It’s 100% polyester with detailed applique and can be machine washed. If you’re looking at high quality baby animal costumes, this is one to be included on your list. The lobster tail shown in the front of the costume is perfect if your baby will be lying down in a stroller. The fabric is a red satin finish. To see more detail about this baby lobster costume, See Here. Sharks have never looked so cute as this! This is a high quality costume from Rubies but the fabric is not very thick. This can be an advantage if you live in a warm climate. If you’re in a cooler climate you can easily dress your baby in warmer clothes under the shark costume. The fabric is 100% polyester and due to the structure and shape it should be hand washed. The fabric is soft enough for your baby to easily sit down or lie down on it. The fin on the back of the costume has been kept soft for this purpose. The costume includes snap closures for easy diaper changes and there’s a zip on the side of the costume as well. There are no feet included because, well, sharks don’t have feet! If your baby or toddler needs to stay cool you can leave their legs bare. If you need to keep them warm they can wear something on their legs. Just a word of warning: If your baby or toddler is tall for their age you’ll probably need to go up a size for this costume. If you’re child is smaller for their age then you should be okay with regular sizing. This shark costume is by InCharacter Costumes. It’s another high quality baby costume. The hood is removable and the costume comes with feet which look like fins. The feet have a non-slip surface on the bottom. The booties can be removed if your toddler is walking and you want them to wear shoes instead. The costume is 100% polyester and you can machine wash it. This is a zipped jumpsuit and there are leg snap closures for changing diapers more easily. The fabric is thin, but not cheap. This is an advantage because it is not as hot and it also makes it easier to get you baby into their child harness in the car if you’re driving somewhere in the costume. Trying to find a cute lion costume for your baby? Take a look at this one. Adorable baby animal costumes can sometimes be low quality but this baby lion costume is high quality. The zipped jumpsuit is fully lined and soft. The fabric is 100% polyester and machine washable. The hood is removable and includes velcro to help secure it. You get feet included with the costume. The booties include a non-slip surface on the bottom of them to make them safer for walking. Remove the paw feet if your toddler is walking outside and needs shoes on instead. You could pair this little lion cub with family jungle theme costumes like Tarzan and Jane. You could also dress Mum as Dorothy, Dad as the Tinman and baby as the lion. 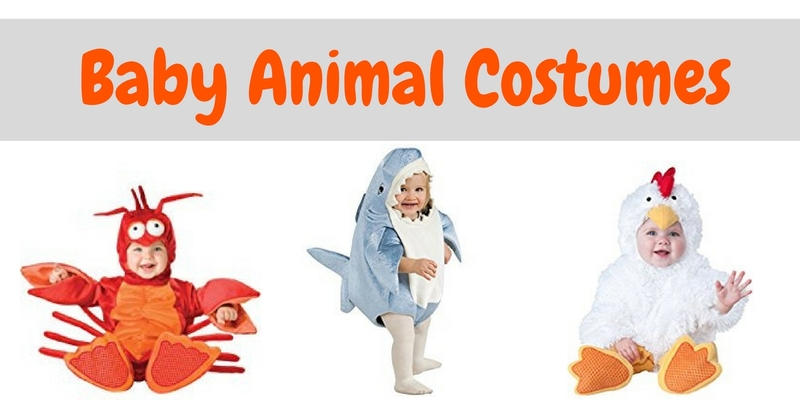 If you have several kids you could choose related animal costumes like lions, monkeys and elephants. This baby lion costume is quite versatile for group themes. Do you have an adorable little monkey in your family. Here’s the costume you need. Similar to the lion costume above, this is a lined zipped jumpsuit with snap leg closures for diaper change convenience. The material is machine washable and the material is 100% polyester. With a fuzzy finish your monkey will look (almost) genuine! The hood and booties are removable. The hood includes velcro to hold it in place. Pair this baby monkey costume with banana, monkey or gorilla adult costumes to include all the family. Is this one of the cutest baby animal costumes you’ve ever seen? 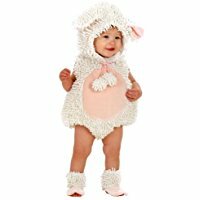 This little lamb costume is adorable for your baby girl or toddler. For more details on sizes and availability, see here. This costume needs to be hand washed. It’s 100% polyester chenille. The costume comes with 4 pieces – the body, hood and 2 shoe covers. If you’re in a colder climate you’ll be able to put a long sleeve shirt underneath the costumes as well as tights. You could use white or pink for the items of clothing underneath. This costume runs small on size. Size up to be sure it fits your little one. ⇒ Looking for an adorable baby tutu for your little girl? See great tutu ideas here. This entry was posted in Costumes on April 1, 2018 by Cindy.